The Dutch Louie Mine is easier to find than it used to be, but most people who hike here are unaware of it. This is the fork in the mine. Both tunnels were dug with the intention of hitting water to enrich the claim. Pacoima Canyon is located below the Dillon Divide, off of an unmarked road called Forest Route 4N25 or Mendenhall Ridge Road. I’ve visited this canyon twice, and as of yet I’ve never seen another soul there. It’s an incredibly long canyon, which was heavily mined for gold, silver and titanium from the 1890s through the 1920s. 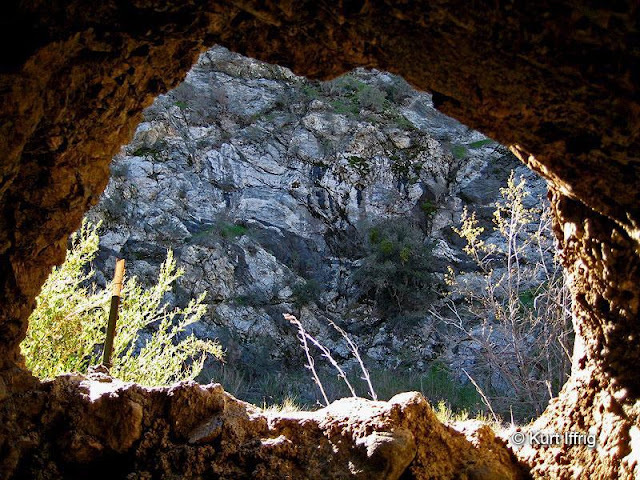 There are many mines in the canyon, some of which I will never find, hidden on the brushy hillsides. At one time there was an underground stream flowing through both tunnels. Now both are clogged, and dry. The Dutch Louie Mine, also known as G.C.K. Placers was a very unusual gold mining operation. The placers were discovered by a prospector who went by the name of Dutch Louie, also known as the Hermit of Pacoima. Placer mining is different than hard rock mining, in that the gold is recovered from a stream bed or lake bed, and not from a mine per se. However, in order to recover more gold, Louie and his partners diverted the stream by tunneling a temporary watercourse through the rock where the creek made a horseshoe bend. The mine was bored with the specific purpose of enriching Louie's claim with more water, gold bearing rocks and sediment. Not so long ago, there was an underground stream that ran through both tunnels, but today it is completely dry, clogged by river rocks. This is a split tunnel, and both forks apparently had upper levels at one time. In fact, the right fork has a rope hanging down that clearly led to an upper tunnel. It is now jammed with rocks, precariously balanced above a small hole in the ceiling. You can see a photo of this clog below, and another of the left fork above. Looking up from the back of the right fork, large rocks have blocked the upper level. Don't pull that rope! Then Goes Home to Die, Leaving Pathetic Note to Coroner. “Dutch Louie,” known throughout the Southwest as the hermit of the Pacoima, a few days ago walked slowly from his hut, which is 5 miles from Pacoima, and selecting a spot on the hillside, dug himself a narrow grave. Then he returned to his home, dressed himself in his best clothing and lay down to die. All that he told in a letter he wrote to the coroner just before he lay down for the last time. The body was found by hunters. I call this Excalibur. It's a small pick head stuck in the rock outside the mine, probably Dutch Louie's. 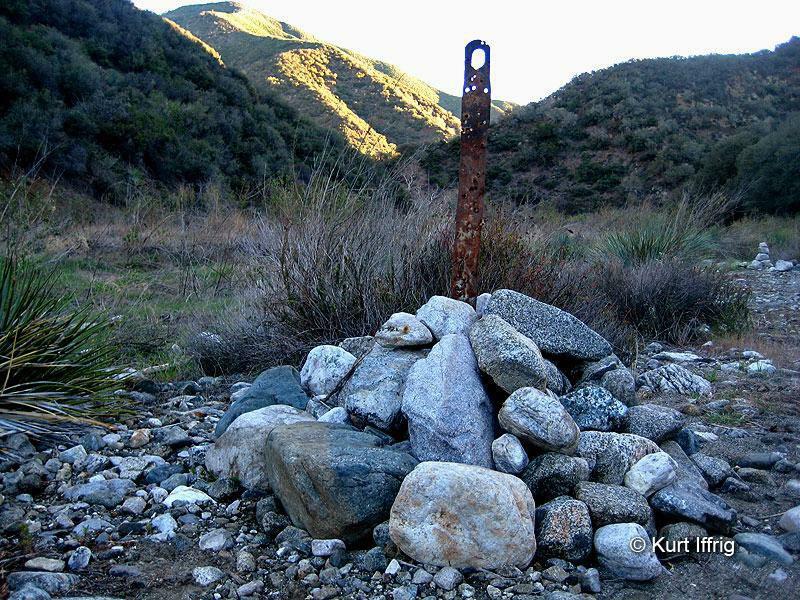 Volunteers have been maintaining a trail as far up as Dagger Flat, a wide spot in Pacoima Canyon, marked by a metal post buried in rocks, seen in the photo below. Beyond this point the trail begins to fade, however it is possible to continue on. At Dagger Flat there is also a side trail that leads up to the Santa Clara Truck Trail, Forest Route 3N17, called the Dagger Flat Trail. I have never taken this trail, but it was reportedly built in the 1930s, and remained unmaintained until recently being restored by volunteers. The 2.5 mile trail reopened in 2014. 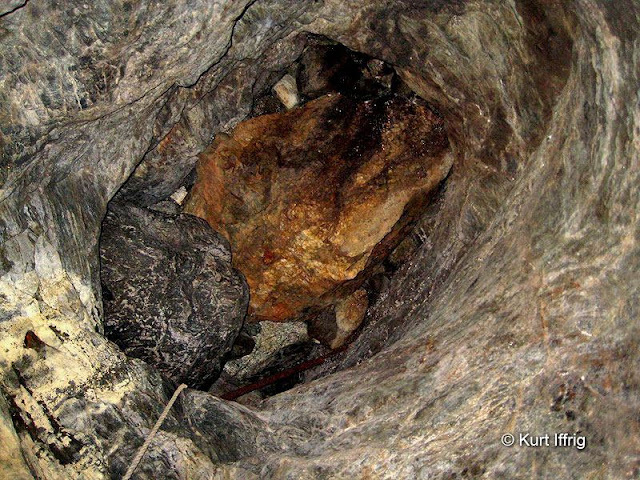 There has been a long standing rumor that a prospector was killed in a knife attack here, over a mining dispute, however I have found no source to back this claim up. Perhaps this is where the name Dagger Flat originated. There are mines beyond this point, just as long as you're prepared for some bushwhacking. Farther up in the canyon is a open area called Dagger Flat. After this point the trail starts to fade away. Depth: Approx. 20 feet deep. Inside is a sealed shaft, outside is an additional clogged adit. Unlike other mines in Pacoima Canyon, this one is quite easy to find. 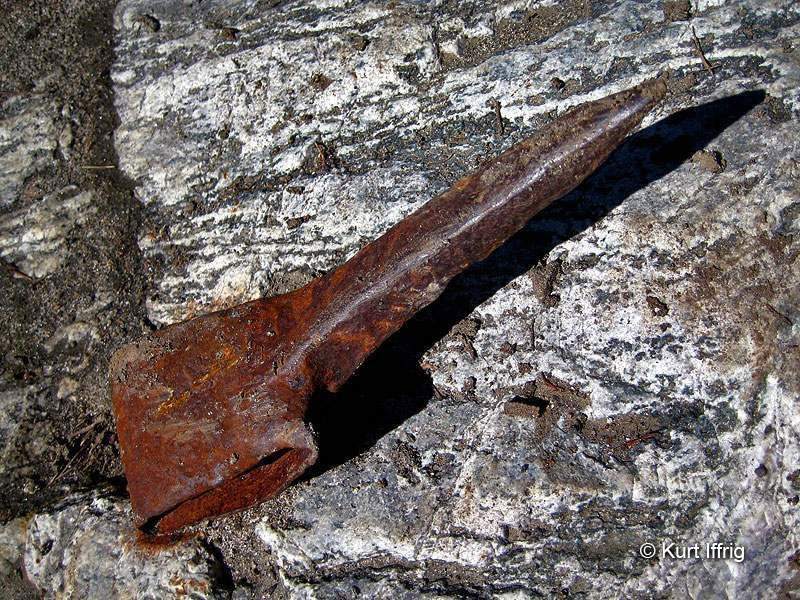 The reddish rock shows iron presence. Many thanks to Forgotten Mining History for confirming the name of this mine as the Denver Mine. The mine went by multiple names, which made Identifying it difficult. Secondary names included the Chance, Fenner, Indicator, Red Ledge and Pacoima Canyon Mine. It was also a part of the Ore Hill Group. 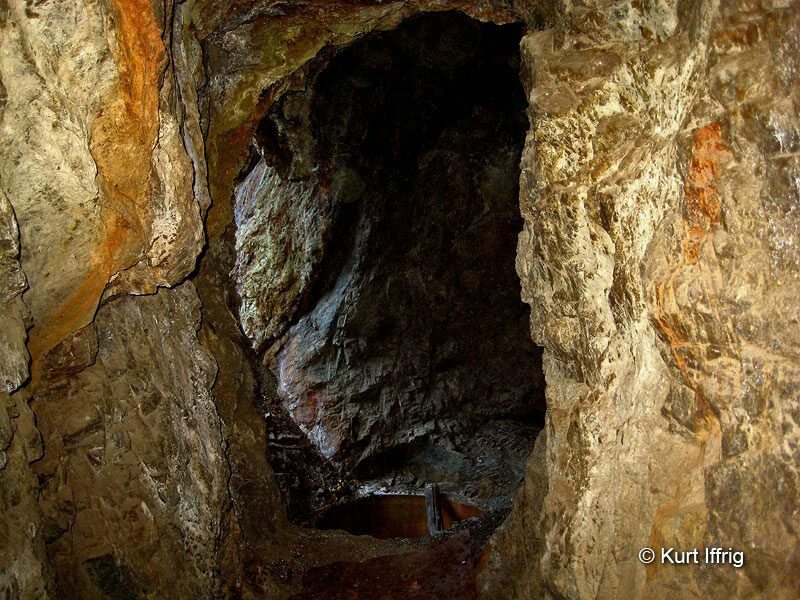 This site was mined for several different minerals, antimony, cobalt, copper, lead, nickel, and zinc. Years of operation and success of this mine are still undetermined. According to Forgotten Mining history this was owned by the Denver Mining and Milling Company in conjuction with the Ore Hill Group. The mine you see further down on this page was probably a part of the Ore Hill Group as well. If this is correct, both properties were later sold and became separate mines. Directly inside the portal is what appears to be a filled in shaft. The mine itself is very shallow. This is a very shallow mine, however, directly inside the portal there is what appears to be a filled in shaft (seen above). To the right of the shaft is a piece of rusty sheet metal, covering a hole that leads into what looks like a caved-in or filled-in tunnel. The portal to this tunnel can be found outside of this mine, slightly to the right . The tunnel looks like it was clogged by flood waters and it's hard to say how deep it originally was. There's actually enough space to crawl in, but it would be extremely high risk to do so. Next to a backfilled shaft there's a metal plate covering a clogged tunnel. I opted not to crawl in. Close to the mine there’s a deep cement well. It's the same type I found near another mine further up the canyon. Also there’s a bullet ridden wall, shot up by some very heavy ammo. This is the one thing I worry about when I hike this canyon, stray bullets. As of yet I’ve never heard any gunfire, but I’ve seen a lot items obliterated by bullets. Close to the wall there are ruins of a very long, odd shaped building. It’s hard to say what it may have been used for, but chances are good that a road once ran through the middle of this canyon, used for transporting ore and equipment. Directly to the right of the main portal is this clogged adit. It looks as if it used to be quite deep. Beyond the second mine the terrain begins to get brushier. Some areas are thick enough that you’ll have to walk through the middle of the creek to make progress. Both times I’ve visited I’ve seen fresh tracks of a mountain lion who roams this area. The farther you go, the thicker it seems to get, which makes the job of mine finding difficult, if not impossible. Nevertheless, I plan to visit this area at least one more time. There are several documented mines I have yet to find. These are the ruins of an oddly shaped building. I suspect there was once a road nearby to transfer ore. Along the way the stream bed briefly widens, and you’ll come across a well built lean-to. It’s hard to say whether this was a shelter or a hunting blind, but it’s just big enough for one person to stretch out on the inside. I call this the Hermit’s Hut, but whoever built it seems to be long gone. On the inside there's a small rock collection and a good view of all four sides through the gaps between the logs. My guess is that this was built by a hunter. 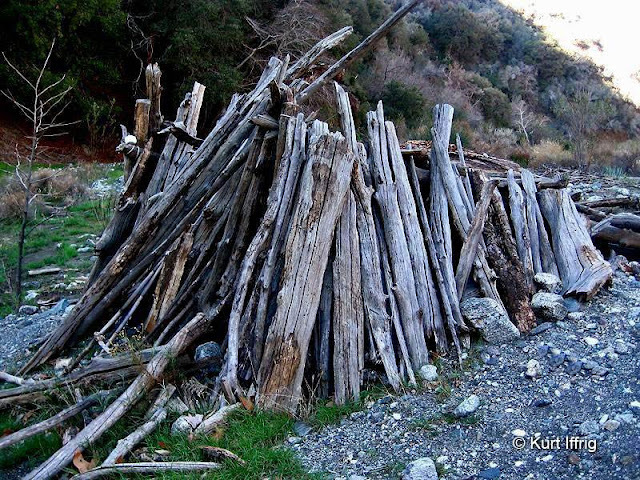 This well built lean-to may have been used as a hunting blind. Or perhaps another hermit lived inside. In my travels I’ve come across quite a few wrecked cars. Some are stolen and dumped in remote areas, others crashed through the guard rail on Angeles Crest Highway and careened down cliffs. I’ve even found a few plane wrecks. But the car in the photo below looks like it was picked up and carried from miles away, by a flash flood. The power of water is amazing. The body has been completely ripped away from the chassis, and the frame has been bent like a pretzel. Ironically, had it not been for this wreck I might have walked right past a brand new mine I found nearby. 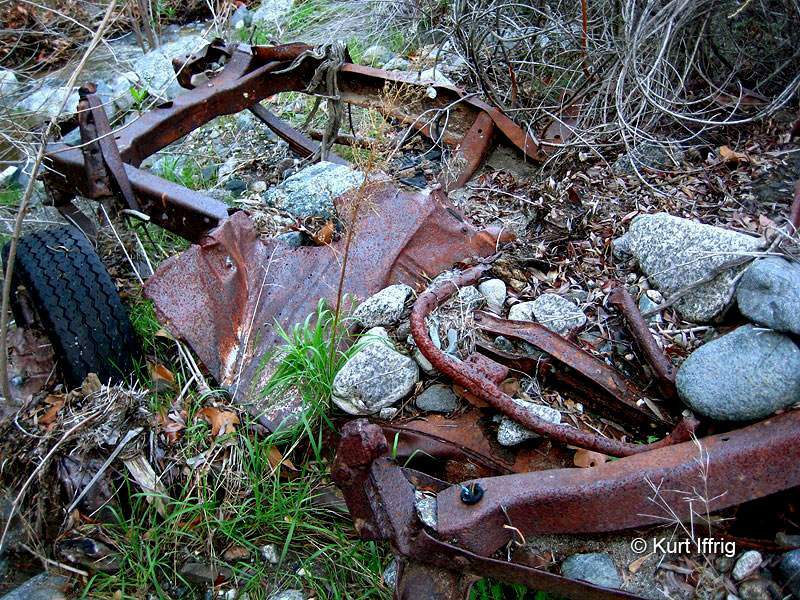 Far up in Pacoima Canyon you can find this full auto chassis, minus the body. I hope the driver survived. Depth: One straight adit, estimated 100 feet deep. Exact depth has not been recorded. This is a mine you probably won't see on any other website. I'm not sure what purpose the half wall serves. You probably won't see the mine below on any other website, at least none that I'm aware of. I'm currently trying to positively confirm its identity, but it was most likely a part of the Ore Hill Group. This company worked with the Denver Mining and Milling Company. Years of operation are unknown. 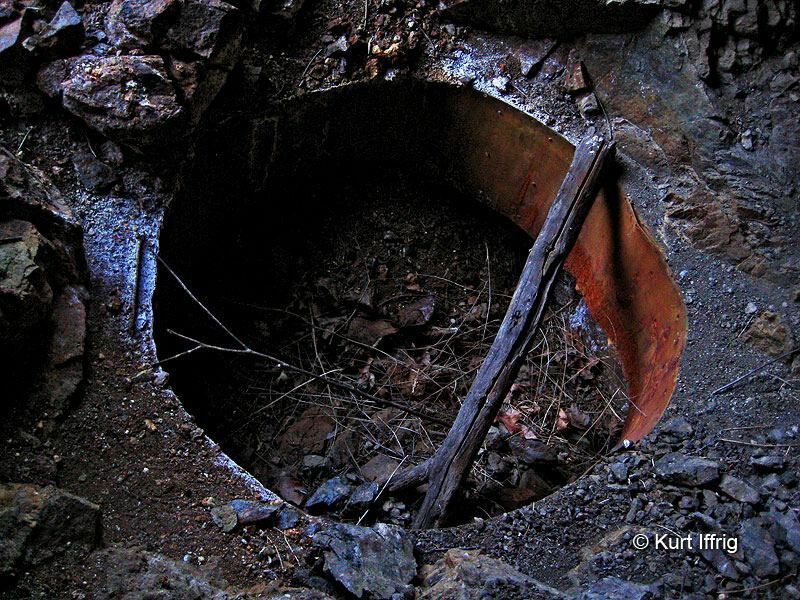 This might look like a crumbling mine, but it's quite the opposite. The inside is solid rock, with no cave-ins. This is a mine that took me by surprise. In fact, I would have walked right past it if I hadn’t slowed down to take photos of a wrecked car. 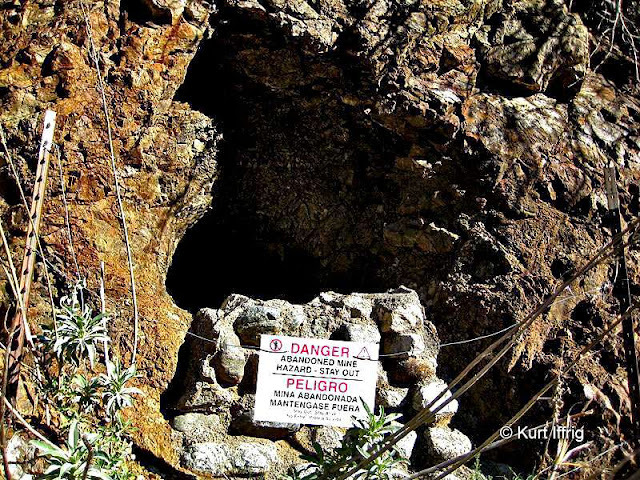 This is one of the few mines I’ve see in the Angeles Forest with warning signs. Supposedly they’re all supposed to have them, but some are so remote that the Forest Service doesn’t bother posting them. The mine has an odd half wall built in front of it. I’m not sure what purpose it serves, other than making it look more ominous. The outside of the mine looks crumbly, but the inside is rock solid. In fact, It's one of the “very few” mines I’ve been in that has no cave-ins whatsoever. If you should happen to find this mine, use your own discretion. ALL mines are potentially dangerous. 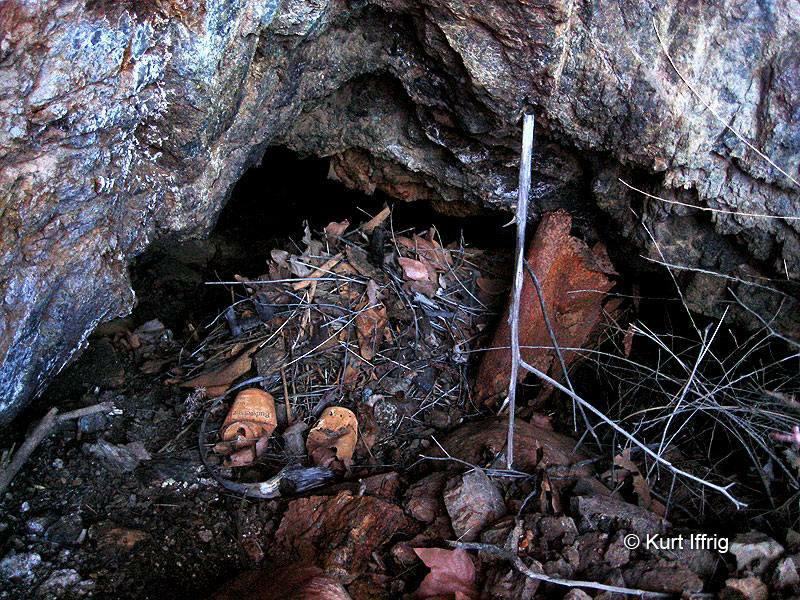 This partially walled mine provides some protection from predators for the animal who built this cozy nest. 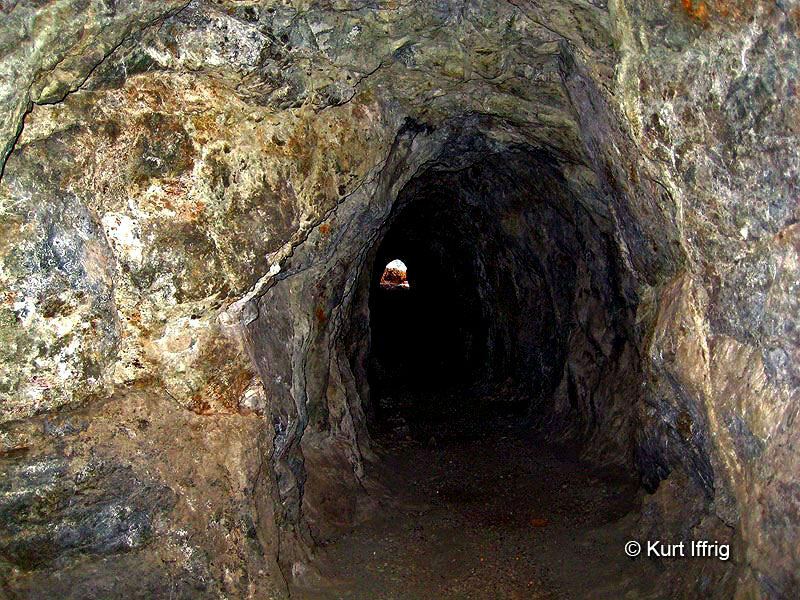 When I enter these mines I always wear a dust mask. The main reason is that mice often live inside, as is the case with this mine. Mice droppings sometimes carry the Hantavirus, which can be deadly if it gets into your lungs. And kicking up dust is often enough to get it airborne. Cases of Hantavirus are rare in California, but who wants to take chances? 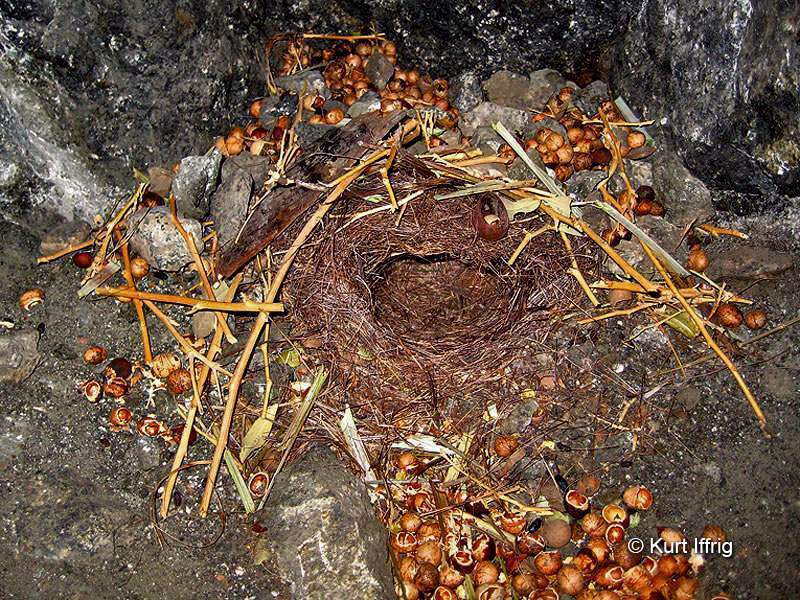 At the end of this mine there’s a nicely built mouse nest, seen above. I wasn't expecting to find this mine, so it's still unmeasured. I would estimate it's about 100 feet deep. The internet can be a valuable tool for mind finding. I visit various sites regularly to compare notes and learn new information on places I’ve never been before. 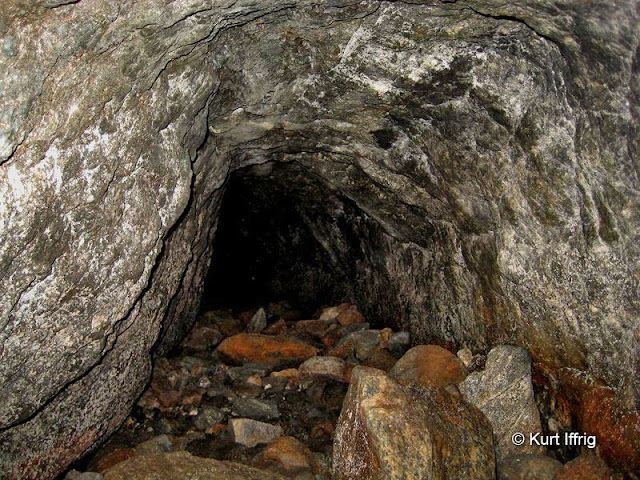 The mine below was found by an extreme hiker named Elwood who posts regularly on a website called EisPiraten.com. 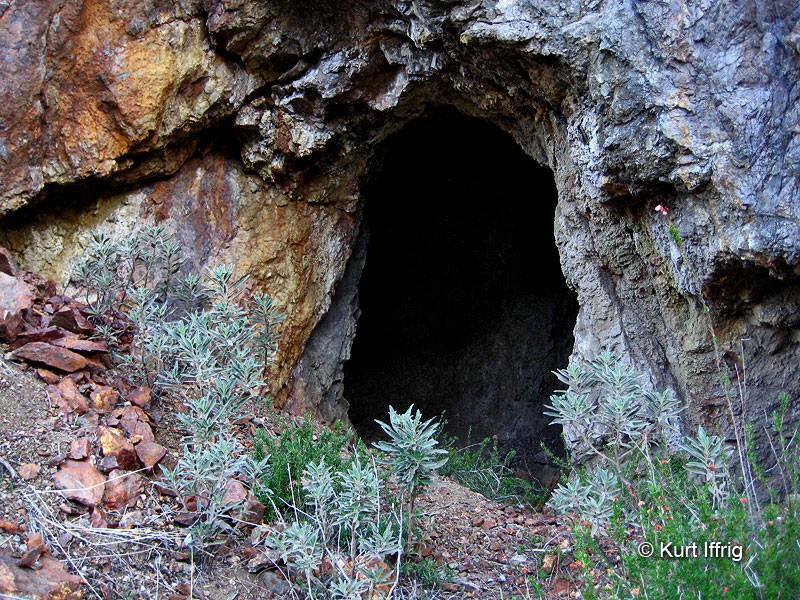 He’s been much further up Pacoima Canyon than I have, and found the fantastic box mine pictured below. Hopefully I will be able to get more photos of the interior and exterior in the future, but what a great find! 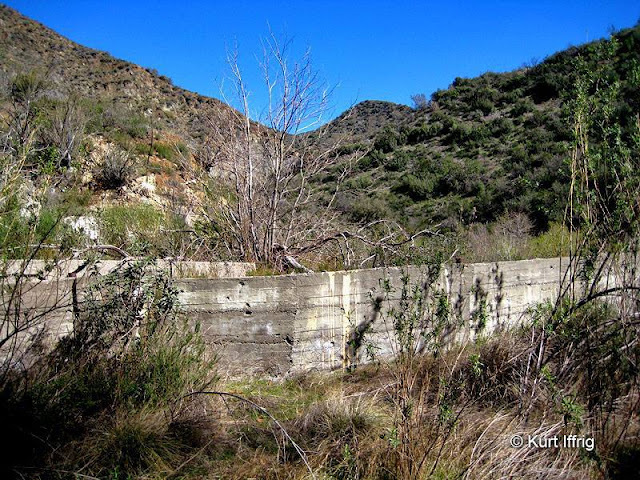 If you would like to see Elwood’s post on Pacoima Canyon click here. I learned about mine from Elwood on EisPiraten.com, a place I go to compare notes with other hikers. Really great right-up! The article on Dutch Louie is interesting. I don't find it as pitiful as the journalist did. He simply came to terms with his mortality and his failure in striking it rich. Determining the names of the mines in this canyon is difficult, as it involves cross-referencing multiple sources. Hopefully I can help shed some light on their identities. The mine you list as the San Gabriel Mountains Mine is actually the Denver or Indicator Mine. 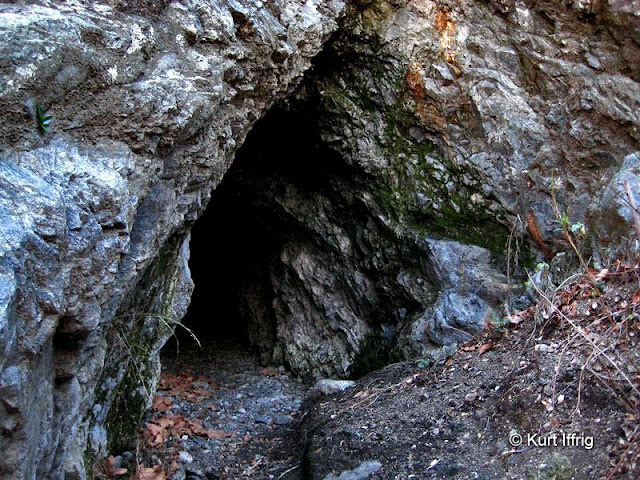 Antimony, cobalt, copper, lead, nickel, and zinc were found here. The one you called the Denver Mine is really the Ore Hill Group. 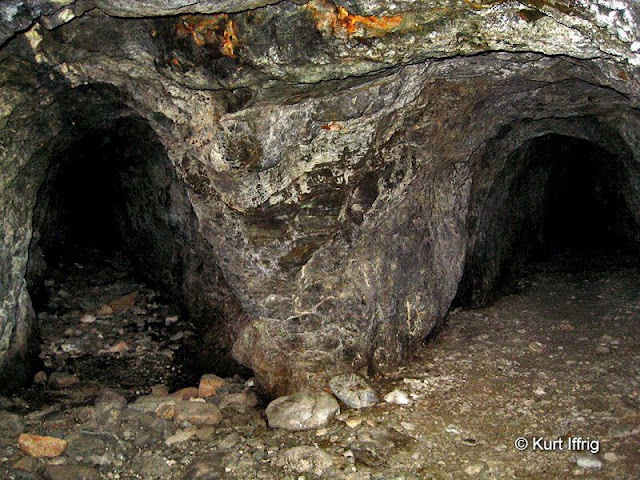 Mineralization was similar to the Denver-Indicator Mine, but gold was found as well. The Denver and Ore Hill Groups were originally worked in conjunction by the Denver Mining and Milling Company. Eventually, both properties were sold and became their own separate mines. 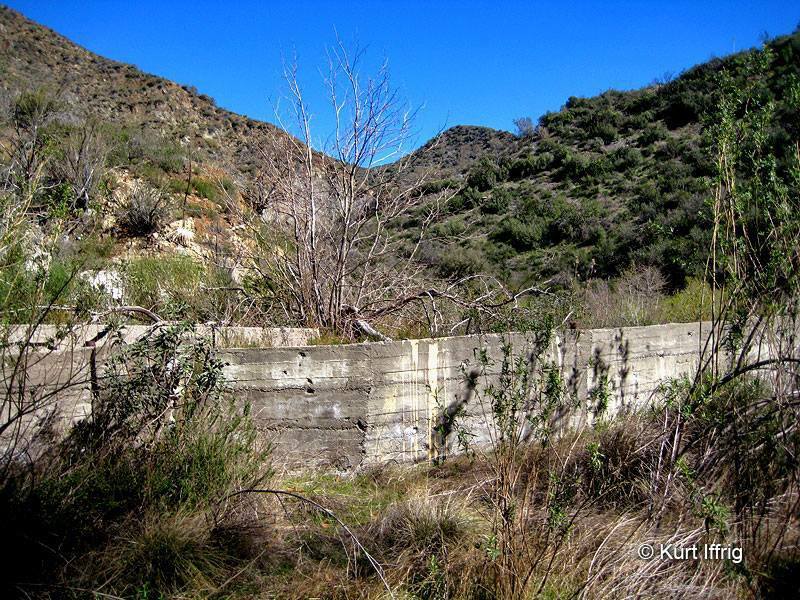 From what I've researched, there were no active titanium mines in Pacoima Canyon. Dozens of locations were surveyed for titanium, including the San Gabriel Mountains Mine, but no production was made. It is labeled as an occurrence by the Mineral Resources Data System. Apparently there is a gold mine located way up the canyon called the Alexander Mine. It is right outside the mouth of Noel Canyon. 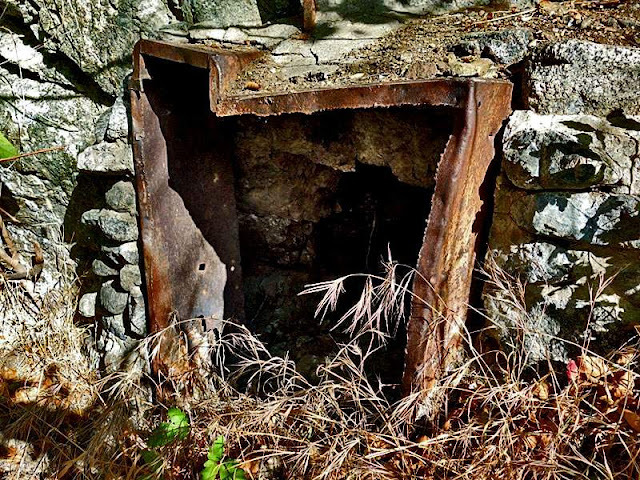 However, mining reports only describe a small shaft on the property, so I wouldn't expect to find any accessible workings. Wow, thank you so much for all of that great information. I will update this page accordingly. I know that there are many more I have yet to find in that canyon, but it looks like some are up on the brushy hillsides and may be impossible to locate. Thanks again for all your help.